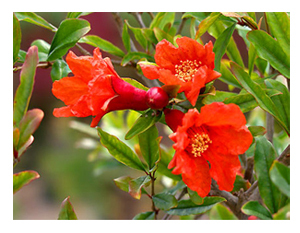 You are at:Home»Herbs»Punica granatum Linn. Latin name : Punica granatum Linn. Description : The seeds and rind are valued as sedative, stomachic, cardiotonic, digestive and astringent in cases of diarrhoea and amoebic dysentery and eases fever. The seeds are given to comfort an upset stomach and as a remedy to relieve wind and nausea. The rind and bark are considered to be specific naturals for tapeworm, pinworms and roundworms infestation. The alkaloids present in the rind and bark cause the worms to release its grip on the intestinal wall. Recommended Dosage : Dried Seeds: 5 to 10 g powder; Rind : 3 to 6 g powder; Juice: 15 to 30 ml. Contraindication : Doses greater than those recommended may cause nausea, dizziness and vomiting.